Why Does Hotaru Wear a Different Mugen Gakuen School Uniform? Don’t be sad, Hotaru! You can wear whatever uniform you want! 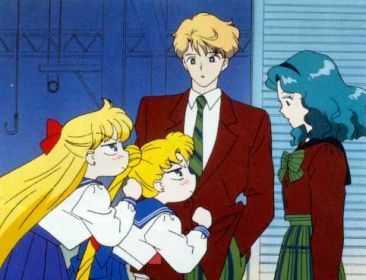 It should probably come as no surprise that we often wind up discussing school uniforms in a blog devoted to uncovering the mysteries of Sailor Moon. The title itself, in fact, is even a direct reference to the naval-inspired “sailor fuku” uniforms worn to school by young women across Japan. If that’s not a tip off to the fact that these things are important, I don’t know what is. But today we’re going to talk about something a little bit different, about one of those details that could easily get overlooked by the untrained eye. Which, of course, doesn’t apply to any of you, my incredibly observant readers! We’ll be taking a look today at why Hotaru’s uniform, subtle though the difference may be, doesn’t match up with the ones worn by Haruka and Michiru. As an extra bonus, this also gives us an opportunity to take a deeper look into the mysterious school that is Mugen Gakuen. Grab a lunch box, because things are about to get educational! Explain your uniforms — now!! 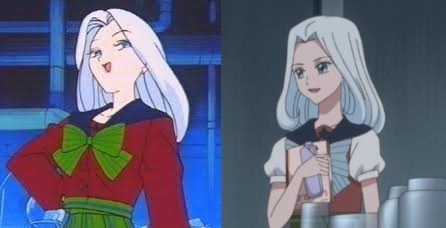 Just to give a little background, this discrepancy between Hotaru and Michiru’s Mugen Gakuen uniforms is something that had caught my imagination for a long time. We see Hotaru so rarely in her uniform in the anime that it’s an easy detail to overlook, but sure enough, her bow is most definitely blue in all official anime and manga art while Michiru’s is consistently green. 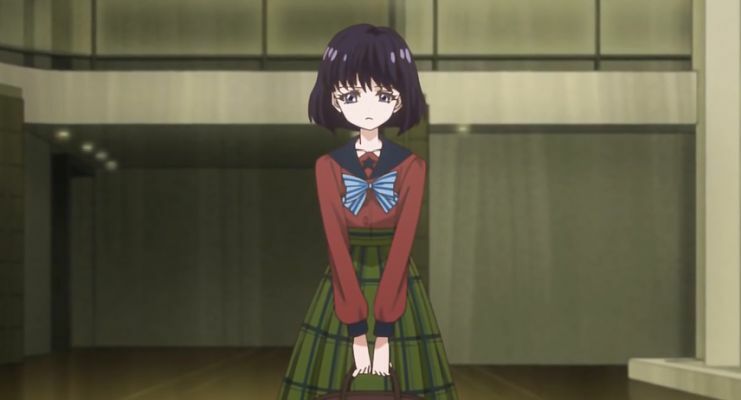 Since Haruka and Michiru’s uniforms are typically seen by fans as the “canonical” Mugen Gakuin uniforms, it would seem that this makes Hotaru’s the outlier. But, as we’ve seen time and time again, appearances can be deceiving. As you probably already know, Mugen Gakuen is an elite school created and run by Professor Tomoe that he uses for carrying out his various nefarious deeds. But referring to Mugen Gakuen as just a “school” is selling it short: it’s actually more like an entire school system. They offer classes all the way from preschool (most likely as young as three years old)1 and through graduate school, meaning that you could realistically spend over 20 years of your life attending Mugen Gakuen if you were rich enough. For the record, this type of arrangement isn’t entirely the work of fantasy. The real life Keio University — which served as the basis for the KO university attended by Mamoru, Motoki, and Mamoru-totally-killed-him Endo — also has its own affiliated schools all the way from preschool and on up.2 But that’s neither here nor there. 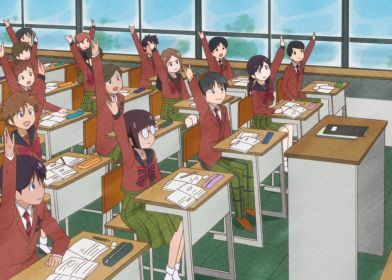 According to Ms. Takeuchi’s incredibly detailed Materials Collection,3 students in the four lowest schools (meaning preschool, elementary, junior high school, and high school) were required to wear uniforms, and each of the uniforms was given its own distinct color to be worn on the bows (for girls) and on the ties (for boys). So even though Mugen Gakuen may technically all be one “school,” it’s still broken down into individual levels, which explains why Hotaru wears a blue bow while Michiru wears a green one. And yes, my rightfully skeptical reader,4 it does! Kind of. What it actually does is bring to light interesting inconsistencies regarding the Witches 5 across all three versions of Sailor Moon! In the 1990s Sailor Moon S, Viluy was depicted as having a green bow (= a high school student) while she is depicted in Sailor Moon Crystal as having a blue bow (= a junior high school student). Tellu, Cyprine, and Ptilol also show their true colors as junior high school students and sport blue bows in Sailor Moon Crystal, while Eudial is shown with a green one, making her the oldest of the group. Read also: Why Are Sailor Saturn and Sailor Pluto's Roles Reversed? … kind of. Mimete also has her own consistency issues, though hers are slightly different. She’s depicted as having a green bow in the Materials Collection5 and a blue bow in Sailor Moon Crystal. What does this all mean? Well it would mean that at least in the Sailor Moon Crystal telling of the story, Eudial is the oldest of the Witches 5, though that’s a little less clear in the manga (since we can’t actually confirm bow colors for any characters other than Mimete). The 90s anime seems to have increased the ages of most of the Witches 5 anyway, making it a lot harder to guess any age differences between them. 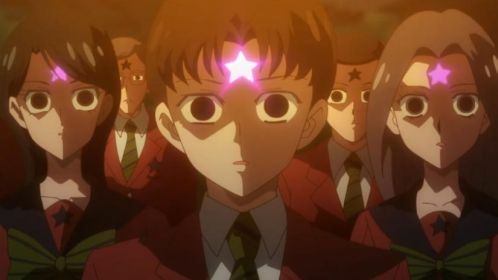 However, since it appears that most of them are at least university students, that would possibly make Viluy the youngest in that version of Sailor Moon since she’s in high school. So what do you think is going on with all this age weirdness, especially with regard to Mimete (since Crystal typically tries to track closely with the manga)? Just an oversight in Crystal, or possibly Ms. Takeuchi had a change of heart during the manga run after the Witches 5 concept art was drawn? Though this is all pretty minor, I just love this kind of stuff, since understanding how the characters relate to each other can really change your perception of the story! ← What Was the Inspiration For the Three Lights’ Names? If memory serves, Tellu is depicting with a green bow in the original anime. You see her student ID once. I looked high and low for an image of this, but couldn’t find anything. I suspect you’re right, though. If they show a bow, I’m pretty sure it’d be green. What color is Tellu’s bow in the photo on her ID/booklet in ep.121, the one found after her death? It looks green to me on a DVD-quality video, but I’m not sure… in fact, I’m not even sure it’s a Mugen Gakuen uniform at all, but it looks similar. I can’t quite recall, but I’m not entirely sure if that’s even a student ID. I always thought it was a Death Busters ID/researcher ID card for going around the Mugen Gakuen campus, but I could be totally wrong! Anyways, what a neat detail! Maybe since Viluy attends the same cram school class as Ami in Crystal/manga, they have to be the same age? I really don’t know how the cram schools work over there ;_;. And the other Witches track with the Senshi in a similar fashion which they didn’t quite do in the 90s version… Though Mimete is sort of a “senpai” type to Venus since she’s an established idol. Maybe Naoko was thinking at first she would be older as well as more established? It’s actually really weird to me to look at the Witches 5 as being younger that Haruka and Michiru now. I always thought they were either the same age or older (seeing as Eudial drives a car — and ignoring for a second that Haruka also drives). I guess it’s more because I always looked at the Witches 5 as more like mutual enemies to both Ura/Nepu as well as the Inner Senshi, so it made sense for them to be a little older. After all, almost every other villain is older, with the exception of the Amazoness Quartet. I always thought that the Witches 5 merely disguised themselves as Mugen Academy students, but didn’t actually attend the school. I believe Mimete calls Eudial a “Christmas Cake” at one point, meaning she’s likely over 25 (and the oldest of the Witches 5), but I think they’re all past high school age. In the manga (and Crystal) I believe they attend, but the Witches 5 appear to be much older in the anime (excluding Viluy and Tellu, of course). Since the school is run entirely by Prof. Tomoe (and thus run by the Death Busters), they wouldn’t really have any need to infiltrate or sneak around the school — they have all the access they could possibly need already. LMAO Christmas Cake! XD I didn’t realize! Huh, interesting…! Must be an animation error?